The day after the big Obama-Romney debate, as media and politicians were engaging in the usual after-action assessment frenzy, some of the most important issues surrounding the September 11 attack on the U.S. Consulate in Benghazi, Libya, remain unaddressed. While it clearly matters (a lot) if and when the President told the truth to the American public about the terrorist nature of that attack and why the Department of State refused repeated pleas from its own diplomats in Libya for more and better security, the deeper, unaddressed issue is about the relationship of the U.S. government, Ambassador Christopher Stevens and the U.S. diplomatic mission in Libya with Al Qaeda. During the 2011 Libyan revolt against Muammar Qaddafi, reckless U.S. policy flung American forces and money into the conflict on the side of the rebels, who were known at the time to include Al Qaeda elements. Previously the number two official at the U.S. Embassy in Tripoli, Christopher Stevens was named as the official U.S. liaison to the Libyan opposition in March, 2011. Stevens was tasked with helping to coordinate U.S. assistance to the rebels, whose top military commander, Abdelhakim Belhadj, was the leader of the Al Qaeda affiliate, the Libyan Islamic Fighting Group (LIFG). That means that Stevens was authorized by the U.S. Department of State and the Obama administration to aid and abet individuals and groups that were, at a minimum, allied ideologically with Al Qaeda, the jihadist terrorist organization that attacked the homeland on the first 9/11, the one that's not supposed to exist anymore after the killing of its leader, Osama bin Laden, on May 2, 2011. Although Belhadj reportedly now has moved on to Syria to help lead the fight against the Assad regime being waged by the Syrian Free Army (SFA), other Libyan fighters, who were formerly members of his LIFG and other Al Qaeda affiliates formed a new terror militia in Libya (and elsewhere) called Ansar al-Shariah (Supporters of Sharia/Islamic Law). According to an August, 2012 report from the Library of Congress and the Kronos organization, "Al-Qaeda in Libya: A Profile," Ansar al-Shariah is an Al Qaeda franchise operation, established in Libya with the assistance of senior Al Qaeda operatives dispatched from Pakistan specifically to supervise the set up of a new clandestine Al Qaeda network in Libya that would refrain from using the Al Qaeda name. The Derna, Libya Ansar al-Shariah cell is led by a former GITMO detainee named Sufian Ben Qhumu. The September 11, 2012 attack on the Benghazi consulate compound that killed Ambassador Stevens, his staffer Sean Smith and the two Navy SEALs was directed and led by Ansar al-Shariah. One of the key unanswered, even unasked, questions about the U.S. and Ambassador Stevens relationship with Abdelhakim Belhadj concerns not so much the 2011 period of the Libyan revolt, but rather what followed. Was Ambassador Stevens still in touch with Belhadj and/or other Al Qaeda-linked figures even after Belhadj traveled to Istanbul, Turkey, in November, 2011 to make contact with the Syrian Free Army? According to August, 2012 reports leaked to the media, sometime earlier in 2012, President Obama signed an intelligence finding to permit the CIA and other US government agencies to provide support to the Syrian rebels, whose ranks are reported to be dominated by Al Qaeda, the Muslim Brotherhood and other jihadist fighters who already are supported by Turkey, Saudi Arabia and other jihadist regimes. Was Belhadj a conduit for U.S. support, perhaps via Turkey? It might be recalled that, according to the Department of State's transcript of a October 9, 2012 telephone conference call held to brief reporters on what happened in Benghazi, the final meeting that Ambassador Stevens held the night of September 11, 2012 before the attack began was with a Turkish diplomat. Was that the meeting that was so important that the ambassador felt compelled to slip into Al Qaeda-held Benghazi on the anniversary of the original 9/11 attacks, knowing that Al Qaeda leader Ayman al-Zawahiri had called for revenge for the killing of his Libyan deputy, Abu Yahya al-Libi, concerned that he might have been on an Al Qaeda hit list and fully aware that he was terribly exposed with completely inadequate security? Was Ambassador Stevens directing a weapons pipeline from Libya to the Syrian rebels with Turkish assistance? 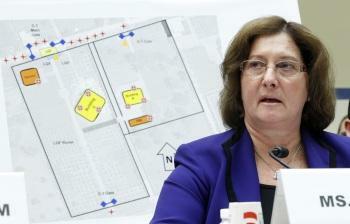 As noted by at least one observant blogger, two buildings appear on the overhead image of the Benghazi consular compound that may be viewed behind State Department official Charlene Lamb during her October 10, 2012 Congressional testimony but were not mentioned at all in the October 9, 2012 briefing mentioned above. Might these two warehouse-like buildings be storage facilities for Libyan weapons either bought back or otherwise collected prior to onward shipment? The New York Times reported in July, 2012 that CIA officers were operating out of southern Turkey to help channel weapons to fighters supposedly not allied with Al Qaeda or other terrorist groups. In a October 14 piece, though, the Times asserted flatly that "Most of the arms shipped at the behest of Saudi Arabia and Qatar to supply Syrian rebel groups fighting the government of Bashar al-Assad are going to hard-line Islamic jihadists, and not the more secular opposition groups..." And while U.S. officials continue to stick to claims that they are not providing arms directly to the Syrian rebels, but only channeling weapons that come from Saudi Arabia and Qatar, reports that those rebels now have surface-to-air missiles call to mind the thousands of such weapons looted from Muammar Qaddafi's stockpiles during and after the revolt that ousted him in October 2011. On October 17, 2012, Reuters reported that the Syrian rebels had acquired surface-to-air missiles, forcing the Syrian government air force to conduct bombings from higher altitudes. An August, 2012 video posted online purports to show a Syrian government helicopter hit with an anti-aircraft missile, on fire and spiraling to the ground, where it exploded into a fireball. Many questions remain about what happened in Benghazi that night, not least of which is why Belhadj and Ansar al-Shariah would turn on Stevens, who had been their staunch if naïve ally, when his killing in the course of the attack on the consulate likely would end any weapons supply to the Syrian rebels he might have been directing. Was marking the 9/11 date with revenge for the death of al-Libi more important in the eyes of Al Qaeda than the preservation of this particular weapons source? Were there weapons in those two buildings on September 11, 2012 and were they looted that night? Had Stevens and/or the U.S. somehow failed to come through with an understood commitment of some kind? In any case, false information about the 9/11 attack in Benghazi being the fault of an online video that seems to have originated with the Office of the Director of National Intelligence (ODNI) James Clapper (perhaps with the collaboration of CIA Director David Petraeus) was put out and repeated by senior administration officials for days following the attack.